On O'Mara, Social Media, and being invited on to Newsnight. So, following the Guido* revelations earlier about Jared O'Mara's online comments concerning Michelle McManus winning Pop Idol in which he called her "fat" before launching into a rant about "fatties", I wrote a Twitter thread, that spawned this post, and also prompted an invite (unfilled) to go on Newsnight. No really. Now, before we go any further, let me be unequivocal: the remarks were lamentable and are to be condemned. In addition, they seem to fit into a pattern of misogynistic and homophobic comments that give a great deal of cause for concern despite the time lapse. Given the quantity and nature of these, I think it is right for him to have resigned from the Women and Equalities committee today. He now has a job of work to do to convince people he no longer holds the views reported. That being said, though, I think there is an issue to explore here with regard to the use of social media, the permanent record it generates, and what should count as "fair game" for attacking those who become public figures. This blog is an attempt to unpack some of my views expressed on Twitter earlier, and to address the responses to them. You can see these on this storify. My first point was that the McManus remarks were 14 years ago, when O'Mara was a 22 year old. At that point he may not even have envisaged a career in politics, and his views may well have matured and developed since then**. He wasn't an MP or any other type of public figure at the time. So is it fair to trawl someone's social media history for past indiscretions, or for inflammatory or controversial comments? And how far back do we go? In my Twitter thread it was at this point that I moved from considering O'Mara to an hypothetical MP, mainly on account of already being aware of questionable views disseminated by the member for Sheffield Hallam even before all of today's revelations. But there are other real life cases we could look at. Take Mhairi Black, for example, elected at the age of 20 in 2015, she had several years of tweeting behind her, and on record. This included several featuring "parliamentary language" and a number which were subsequently deleted. Hers, though, weren't on issues of substance - although maths teachers and Celtic fans might disagree - so should we treat the youthful indiscretions of a teenager differently than opinions of someone in their early twenties? Some of my Twitter respondents suggested that 18 should be considered a cut off point - and pointed out that "I was younger then" isn't a good excuse. Personally, I'd take a more nuanced point of view - I've met teenagers more mature than folks in their mid twenties, and people whose views (particularly on issues of equality) have changed and developed well into adulthood. That's not to say that I don't think age should be a factor when making a judgement on whether something is in the public interest, in addition to being in the public realm, but I do think that someone's more recently expressed views should be given greater weight. I also think remarks made by those once they are seeking public office deserve a more intensive examination that those from before that point. Like so many issues, this partly comes down to education. O'Mara's generation embraced the internet and Social Media with little acknowledgement of its permanent nature. The current and future generations need to be taught that online security extends to being aware that once something is online, its online for good. Don't go posting something you couldn't comfortably say to someone's face might be a sensible rule of thumb to start with. Unfortunately, I sat on it for 40 minutes before replying, which is clearly too long in telly terms... What would I have said? Probably along the lines of the above! And now it's online, its here for all to see. * Note to self: you maybe should stop responding to Guido articles. *** Apologies if this describes you - I don't want to suggest that you have nothing to offer, but if this becomes an even more well tread path to parliament, we will lose out on talent from other walks of life. It’s 2020 and Oscar season is upon us. Film studios, directors and producers are busy touting their wares to the members of the Academy, offering up their prize films to the electorate and soliciting interest – and votes – with adverts, direct mail and parties. Campaigning is in full swing, and you’re flattered to be invited to an exclusive screening of the highly rated “The Hat”, hosted by the studio chief and followed by a private party with some of Hollywood’s finest actors and directors. As costume designer, your part in the making of “The Hat” was small, but crucial. As a member of the Academy, though, your vote is worth as much as Spielberg’s or Streeps’. Naturally, you were going to vote for the film in all of the relevant categories – but the invitation was still flattering, and you’re going to make the most of it. As you get ready, you reflect on how much you had enjoyed working on the film, and what a contrast you feel in your career now to when you were starting out. Having climbed the ladder as far as you have has given you a unique viewpoint as you observe the industry, and your place in it. You shudder at the memory of some of the people you have encountered along the way – the power-games and manipulation you had to deal with, not to mention the “favours” expected and unwanted advances rebuffed. The evening progresses and, after seeing the film, you move on to the function. And then it happens. As you enter the gilded function room you see him: Harvey Weinstein. He’s schmoozing academy members, working on behalf of the studio chief, the director, you(? ), to get votes for the film. You can’t believe it; after everything that emerged in 2017, it beggars belief that he should be here, pressing the flesh, and continuing to wield influence. Sound unlikely? I hope so. But it wouldn’t be without precedent, or application as an analogy. Earlier today, Guido Fawkes published a story about a certain peer of this parish attending an event in Brussels with our Acting Chief Executive, various of our MPs, our MEP and others. Like all good Lib Dem photos, all the women were at the front, promoting diversity and an (almost) gender balanced group – and at the back was Lord Rennard. A further photo showed him campaigning for Vince in Twickenham in June. Just as Harvey Weinstein’s continued presence as a manipulator of Oscar voters seems unconscionable, so should the reinstatement of Lord Rennard to any positions of influence and power within the party. Tonight, via the machinations of the Labour Party byzantine internal processes*, delegates to their conference opted NOT to discuss the party's #Brexit policy**. So on the single biggest issue of our time, Labour's much vaunted internal "democracy" has ensured that it won't be discussed. Of course, this will suit the leadership in its continuing quest to face both ways on the issue: supporting Brexit whilst doing just enough to keep pro-Europe supporters on board. In this regard talking about "Austerity", the NHS, Schools and Inequality is the right approach for Corbyn. And they are all important issues - and should be talked about: but it's hard to see how Labour's approach to Brexit will not have an adverse impact on all these areas. Corbyn's long term Euro-scepticism, and antagonism to pluralist politics, put paid to any prospect of Labour leading a coalition to mitigate the impact of Brexit and push for, say, the Norway solution. But what of the picture? Well, surviving pro-Europeans such as Mike Gapes MP and Richard Corbett MEP are circulating it as proof of what Labour's policy is, decided at their last conference. 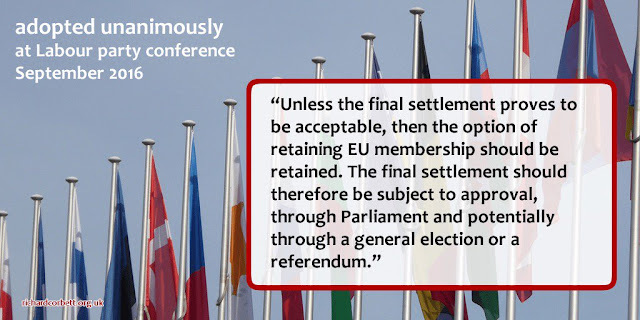 Of itself, the wording of the policy may give heart to those who see Labour's approach as playing a long-game - but their actions since the referendum have not suggested that they have such a long term strategy. Indeed, the policy itself was "clarified" just hours after to state a referendum didn't form part of their approach, and since then Article 50 was invoked with Labour support and a general election. In that time, Labour have disabused those of us who hoped they might argue for the Single Market and Customs Union. At best they have remained agnostic on these, at worst they have abandoned them altogether (other than in a transitional period.) This lack of clarity was enough to see them gain left-of-centre votes in a two-party contest. What remains to be seen is how long this anti-Tory support will weather a pro-Brexit policy. **in contrast to the Lib Dem conference where hundreds of delegates turned out first thing on Saturday morning to force a suspension of standing orders and a debate on a motion, rather than just a consultative session. According to Goodreads, 5 stars mean I found this book "Amazing"... in reality my feelings are much more mixed. I've been a fan of Atwood for years, but have somehow only read a handful of her works and I was prompted into reading The Handmaid's Tale ahead of watching the TV series which I've been recording. It *is* in so many regards an amazing book - but it is, in many many places, a deeply uncomfortable read. Some of that is in the power of what is unwritten - the brutality of the salvagings is hinted at, but these showcase executions are conducted in a surprisingly civilised fashion, right up until the moment of "particicution". Atwood's vision of a dystopian near-future, is fascinating in its attention to detail: not just in the construction of the alternate society, but in how such a society could come about, and how quickly it could be adopted as the "norm". In this respect, this is a book about human nature: what drives individuals to dominate, and others to submit. Do you resist the imposition of a different- and brutal - set of rules? And, if so, how? Despite the presentation of Gilead as a fiction, it is not unlike other societies that the world has known - with elements reminiscent of medieval times, as well as totalitarian regimes of the 20th century. Indeed, in the "historical notes" which conclude the book, looking back on the events described by Offred in her narrative from the the safe distance of 2195, reference is made to a study entitled "Iran and Gilead: Two Late-Twentieth-Century Monotheocracies as Seen Through Diaries." The Handmaid's Tale is often held up as a "feminist" novel and a statement on the treatment of women in society and, in part, it is. But the presence of the "Aunts" and they way they, too, partake in the brutality of Gilead suggest this is about more than the male/female power dynamic. For me, the power of the book is not how alien the environment it presents is, but how familiar. What we take for granted as "civilisation" is shown to be fragile - something to be worked at and built on, or else human nature will out - and who can tell if you will be a Commander, a Wife, or a Handmaid, or worse? P.S. The latest edition of the book, released to tie in with the TV show, has a new preface by Atwood herself. If your copy doesn't have this, it is worth looking up - it can be found on Google Books. P.P.S. This is a copy of my review from Goodreads, which you can find here.